I keep thinking I should blog. I have a list of bloggable things. Then an inertia overtakes me and I don’t. I’ve been reading blogs but I haven’t been commenting as much as I would like either (again)….meaning I will catch up with it but I’m fighting a losing battle on what seems like all fronts at the moment. It’s a busy time at the moment work is busy (this is a good thing, I really don’t like being idle) and of course there’s life stuff to keep up with. So of course it’s not all doom and gloom. There have been plenty of bright moments over the last 40 odd days…here of just some of them. Day 38 – We took advantage of the enforced INSET day at the start of half term and went to Yorkshire Wildlife Park. It’s a great day out and ticks all our boxes. 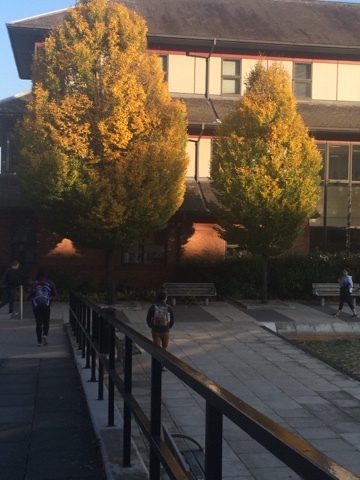 It’s not a too arduous journey, there’s plenty to see (and lots of new things too), plenty of places to have a picnic, you’re outside walking round so getting some fresh air and there’s an ice cream stop. Since we last visited they’ve taken in some more polar bears. 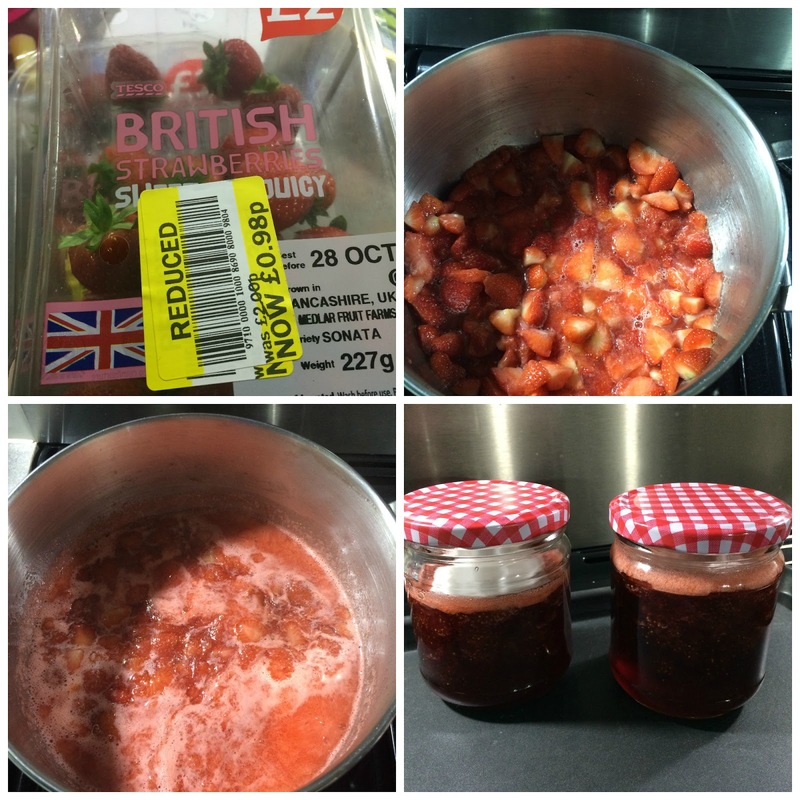 Day 42 – Half term passed in a blur really. I took a day off work and spent it day with BigR. As a surprise I booked into our local pottery painting café. We had great fun working on our items. 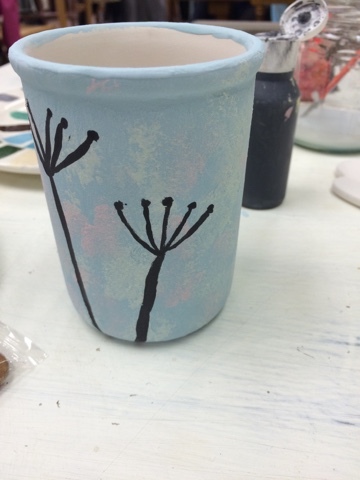 BigR painted a plate (she drew some dolphins) and I painted a pen pot and then we both did a Christmas decoration. (They’re now adorning the tree…more on that later….) In my mind's eye there would be seed pods on a mottled background. Next time I';ll sue a finer brush. The pot now sits atop our microwave. Day 45 – Madly I let BigR choose a little gift in The Works. 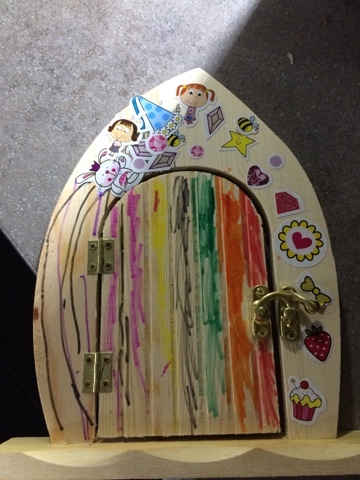 She chose a fairy door….and so her fairy, Verbena, was born. Verbena visited every day for 4 days until she ran out of fairy dust (read I just couldn’t think of anything else to say in response to the weight of pictures and offerings left at the door). She’s due to make a comeback soon. Day 46- I couldn't leave these strawberries in the shop. They were destined to become more jam. And as Sarah pointed out on Instagram Lancashire grown to Yorkshire made. 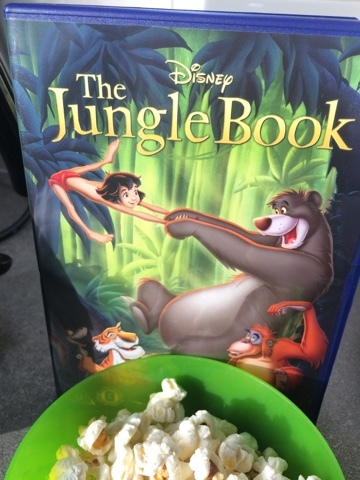 Day 53 – The weather was so poor we stayed at home and watched a new film…The Jungle Book. We had popcorn. It was great fun. 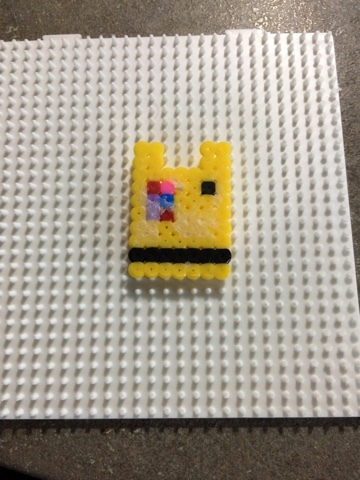 Day 59 – BigR once again showed her creative side and made a Hama Bead Pudsey Bear. I failed a little on my part by sticking the ironing paper to the creation. Iron too hot? Not concentrating? Still I redeemed myself with a sponge cake. 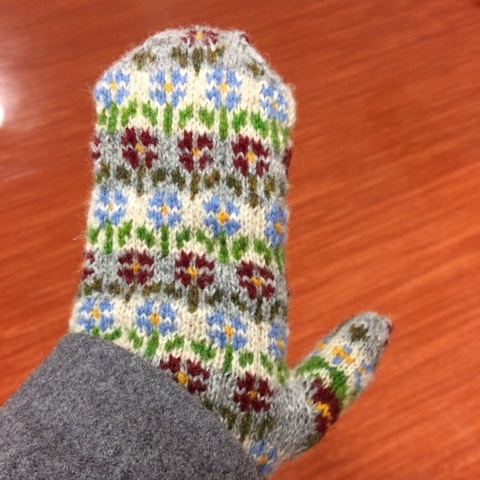 I also admired my mittens that my very talented friend Sarah made me. They combined well with the floor of the Leeds General Infirmary. 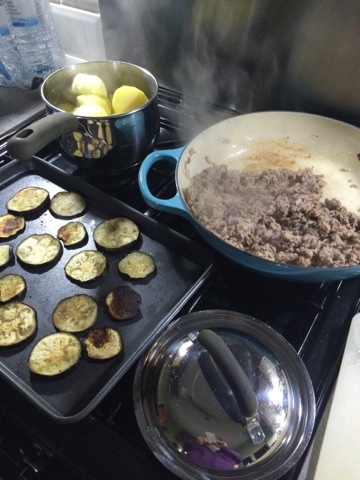 Day 62 – Enthused by watching Rick Stein eating moussaka I made us one (to be eaten the next day). I started it at 7pm one night when the girls had gone to bed. Around 8pm I wondered why I thought it was a good idea as there were pots and trays everywhere and my béchamel wasn’t thickening. When I’d finished though and I’d cleared up I was really pleased. There’s something I love about pottering around in the kitchen making something to have for another day and being that organised! I’ve spent a lot of time slumped in front of the TV lately, a bit too tired to be bothered doing anything, so this really helped with that inertia fug. Plus when we ate it, it was delicious. Day 63 – Finally I made the arms for the knitted dolls I’m (still) making. Eventually they’ll be two dolls. Eventually. 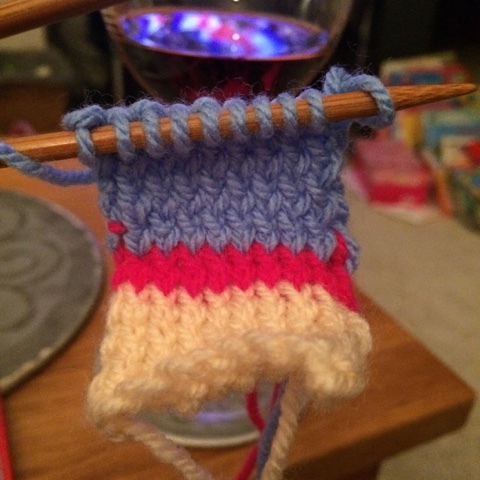 I really rather liked how the French flags reflected in my wine and almost matched my knitting. Day 70 – Sometimes I really love my job. Today was one of those days. I was assessing a session where the students were teaching. I’ve learned so many things from these sessions over the years. 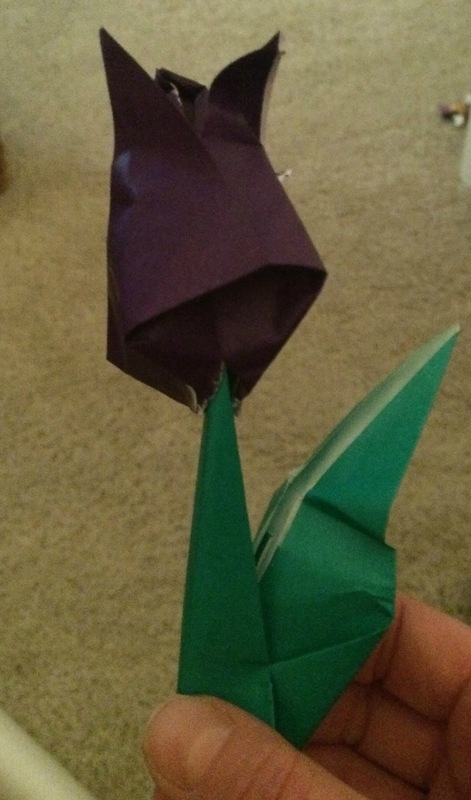 Today I learnt (amongst other things) how to make an origami tulip. Brilliant. Day 74 – The weather was atrocious and the ABO is working the next few weekends so we both ventured into the loft to get the Christmas decorations out. The tree is now up…(perhaps a little early for some) and adorned in a way only a 6 year old and almost 3 year old want to decorate! I added the decorations we made at the pottery painting place and am working on moving some of the baubles around…so we have them a bit more evenly distributed. Day 75 - I'd seen the recipe for these Red Velvet Snowflakes in a magazine and in my carefully planned world I'd prepared and chilled the dough. I was a little skeptical about how this would go as the dough was supremely sticky. Anyway, in my head this was going to be a joyous, child friendly baking activity. Cut to an hour later where I'd used another 50-100g of flour so I could roll the dough out and spent the majority of that time trying to stop two small children fighting or burning themselves whilst covered in flour - we were finally were ready to cut the cookies. Things I have learnt, only cook with one child at a time. Never expect it is easy to roll anything out between two sheets of baking paper. Red Velvet snowflakes are fine as stocking, snowmen and tress and stars. Anyway they taste nice even if I couldn't be bothered to ice them after all that shenanigans! So with a background of illness combined with busyness we’ve had some really good moments. I’m planning to visit and comment on everyone’s blogs this week. I hope you’ll bear with me. Can I also add that IKEA also do ready baked festive stars, with a hole for ribbon. All you need is icing and sprinkles. They've made my life much easier. Your post title reminds me of a song by Kate Nash, when she talks about the grassy cracks that make you trip up. Hopefully the road travelled will be a little smoother for you all. I hope little one is better. And take care of you.